*Update: The contest is now closed. The last counting comment is made by Amber Robbins. Check back tomorrow morning 5.10.10 for the winners to be announced! We love cake stands. They can be used for a long list of goodness, like displaying delicious food, holding flowers, ceramic birds, jewelry, or your teeny tiny dog. Cake stands are delightful but can be pricey, so we are thrilled that making our own stands is a piece of cake! 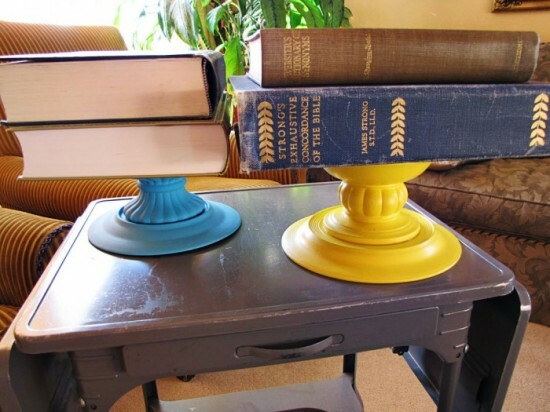 Scroll down to read our tutorial on how you can use your old plates and candle holders to put together a DIY cake stand. *Also, read through to the end of the post for an exciting announcement and our first-ever giveaway! *Note – without using ceramic paint and heat drying it in the oven, these stands are not food safe, hence the paper doilies. They also require gentle care so the paint doesn’t chip, so get those dish gloves out and give them a light hand washing when they need it. See how easy that was? And now for the exciting annoucement: Maydae is launching our Etsy.com shop next week, and in honor of that we want to give away our DIY cake stands to two of our readers! 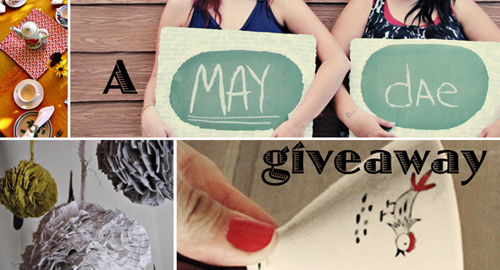 To enter, leave a comment on THIS post between now and Sunday night (5.9.10 at 5:00 pm MST). USA residents only. We will use a random selector to choose two readers who will each receive one of these cute-and-made-with-love-from-MayDae cake stands, and announce the winners on Monday. One entry per person, and don’t forget to post this giveaway on FaceBook and Twitter as well! Your comment can be about anything you want, but if you need a prompt, tell us what you would put on these cake stands if you were to win one. Happy commenting! Yay! I entered! :) Love those. 2 creative ladies, I tell ya! Very creative! Stephanie, did you get those earrings yet? I love reading your blog every day! You guys are my favorite. Hmmmm….what WOULD I put on one of those cake stands? Petits Fours. With tiny roses and green icing leaves on them, stacked as high as possible. And I wouldn’t let anyone eat one because it would look too cute. As soon as I get a job I will be making me some of these for my hope-to-get house :) unless I win the random draw, of course! Love you girls! How adorable! I would totally stack a bunch of iced cookies on one of those! My heirloom cake plate is just too fancy for that sort of thing. I TOTALLY need one of these…and BOTH colors match my kitchen beautifully!! Love you both and LOVE your creativity! You ladies amaze me!! Thanks for sharing! These are wonderful! I hope I win, it would be wonderfully useful! Love you two! Adorable! I love the colors you chose! Too Cute guys! You are amazing! I love you both! On the morning of New Year’s Day, my family always makes Pluckin’ Cake, which is like a giant cinnamon roll, only made by baking little chunks of dough in a bundt pan. Then everyone sits around it and plucks the pieces off and dips them in the icing. A cake stand would be good for that. So totally cute! I would put something totally delectable on it!! This would not just be for any dessert. Love it, love your posts! Hello Ladies, the two of you are so creative. I love how you come up with these ideas. I’m always looking for inexpenives ways to create my own pieces of art. Those cake stands are simple and beautiful at the same time. If i had one of those stands I would be using it to display the wonderful little cookies my little girl decorates for holidays. It would be an excellent finishing touch to her little edilble masterpieces….oh and thanks for another amazing “DIY” idea. You two ROCK! They are so lovely!! I could put sooooo many things on it! Such a cool idea!! Love your wonderful blog and can’t wait for your Etsy shop to open! 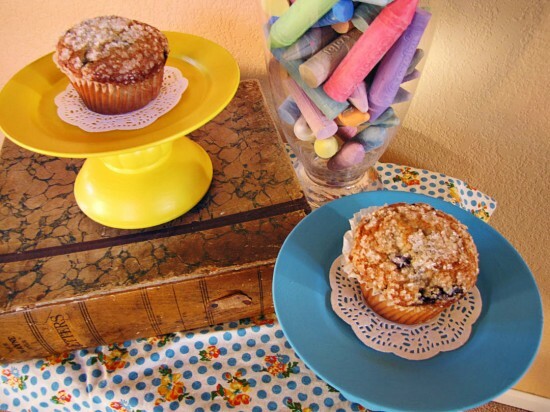 I can see the pretty yellow one stacked high with lemon bars dusted with powdered sugar….Yum! I probably won’t win because I’m the sister but I do love MayDae!!! I heart the cake stands..especially the yellow one! For my wedding (14 years ago) I received a glass enclosed cake stand. I didn’t start using it until last year! I love it and would love one of your cake stands, too! If I owned the cake stand(s) I would put them to use every single week when I cook for the amazing Dine and Discover Lifegroup which meets weekly at my house and I try to always display my food-ness in really fun plates, bowls, etc., because presentation in that form makes all food taste better! OOOOO!!! Choose me! These are beautiful ladies! Great job, you both are so talented! I love the idea and the creativity.Being a diabetic I am always baking sugar free desserts and they would look awesome on one of these cake plates.I bake for friends and give away all I bake to diabetic friends and family. Hmmm… the cake trays look yummy and can make whatever I put in them yummier. I can think of placing anything from a bunch of grapes to easter eggs other than just the cakes. I’d love to have them so that it can start a conversation in my the parties that I conduct often. Ladies, you have got your creative juices running in you. Best of luck in your new venture. I am officially inspired! You make it look so easy and so functional. Carol Ann Kelly sent me here (in case that helps her out somehow). The cake stands are cute! If I don’t win, I might have to try my hand at making some. well i must say i am quite pleasantly surprized by this. :D this was the first time i have heard of you sisters (terrible i know) and i wished i knew before since i have lots of plates and such available. this is like a cooler, modern and money-saving version of art attack. If I were to win one of your lovely cake stands I would use it to serve cheesecake every other Saturday when I try out new recipes on friends. When not in use for food products, I would use it in the living room to house a cluster of tea-lights. I work in ceramics, and tried to throw one of these for the longest time, who knew to make one outta this would be much simpler! I would love one of these to hold my potluck desserts I do every other weekend…My margarita cake would look fabulous on this!!! Really pretty and so creative! I can think of so many uses for one of these stands. I’d love to win one – thank you for the opportunity! nice creativity…i liked it …. What a cute idea! Not sure yet what I will put on it but there are many possibilities. 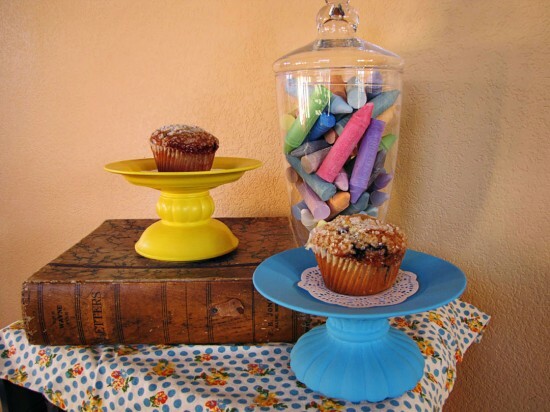 Cute cake stands, I would put my world famous blueberry muffins on them. Ya! Hi. My Gf and i are starting an up scale catering company and we are so broke. all of our money went into preparing to open our new biz. im submitting these comments because we would love some help with little things (like cake stands). My GF is the hardest worker i know and she is very talented when it comes to wedding cakes. i have alot of faith in our biz but we need some help to get things off the ground. thank you for reading. James. What nice cakestands. Perfect for my red velvet cupcakes. 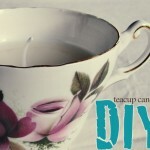 What a lovely tutorial, I want to run out and makes one of these pretties right this minute! Thanks so much for the tutorial and the giveaway. Very cool, I think I need this. 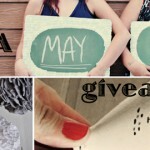 What a great idea and a great giveaway!! I would display some of the veggies from my garden on this delightful stand! this is an amazing idea. I would have never thought of this. I want to win and if I did, since I bake cakes and cupcakes all the time, I would put red velvet cake with cream cheese frosting on them. This is such a unique idea! I am going to bookmark this page because I can see lots of uses for this! I’d put my favorite homemade strawberry cupcakes on it! Love cakestands! LOVE these! Would be so excited to win these!!!! These are so adorable! Thanks for sharing the directions on how to make. I think I just found a gift idea for this Christmas! Even better it’s something my 3 year old daughter could help with! I’d love to win one too, of course! Thanks for the chance! This is such a great giveaway! I would love to win! Okay, I could make my own but I’d rather win one of these! Thanks for the giveaway! these are so cute. I wish I was more creative!! oh my goodness i LOVE these. so much! Fantastic! I’d love to win one, but I’m definitely going to try to make one too! Thanks! What a simply lovely idea! I bake to relieve stress from chronic pain so these cake stands would be constantly filled with all sorts of confectionary goodies..my latest favorites are homemade coconut pineapple cupcakes with mango cream inside (the secret surprise)…They are such a lovely tropical treat and the perfect way to spend an afternoon out on the deck with the sunshine! Thanks for offering us the chance to win one of these. I would have my twin girls use them in school on there birthday to put a cupcake each on it. The teachers let them have a little party with the class so this would make it a little more special. I would put treats galore on one of these! Especially when I’m having a tea party with my little girls. This would be cute for cookies or something when you have guests over! Ooo, pick me, pick me! These are so pretty and cool. :-) I would use them first for some yummy coffee cakes. Thanks! I have been seaching for a cake plate,a nd all I can find is old school ones. You are so cute with your hip cake plates. LOL Bringing fashion forward to the new hip mommies , who like to bake! I would love , love ,love one..and I would tell all my fellow mommies in my mom’s group – to buy- BUY- BUY! PLUS, I really love Estsy , and support as many girlies and boys on there as I can…You have to take care of the artists! and good luck on your new venture! Really great idea! I think I’m going to try it myself this weekend! Would love to have a variety though! Thanks! I think I’ll end up making these myself at some point, but I’d like to win them instead! These are beautiful! I would put my jewelry, rings, necklaces on it. What a great idea for my “handmade Christmas 2010” theme. Of course, “a sample” would be so very, very helpful. these would match my mother’s kitchen perfectly! I had no idea that it would be so easy to make these!!! this is a great tutorial!! Sooo creative! I love love love the cake stands! Hope I win one! Those are gorgeous! Thank you for the chance to win one. I do not have a cake stand but have always wanted one. I think there are so many things to use it for, from candles to cookies and cake of course. These are beautiful! I hope to win! How adorable! Hope I win! Awesome Idea. I love them. I would of course need to make a cake to put on the stand. I think your blog is great and I’ll be tuning in! Thanks again!